Hi, I’m Gilbert, Warm greetings to all of you, I want to tell you a little about myself: I’m a young person who dreams, and my dream is to become an Odontologist or a translator, but I need a little luck to achieve this because I don’t have the needed economic resources. I’ve actually just finished my fourth year of secondary school [note: high school here lasts five years]. My only desire is to serve the community and society if I can make my dream reality. I work as a volunteer Health Promotor with Acción Médica Cristiana, I don’t receive any pay for this work. I’ve also helped Kristin, who has led a good process in a community and whose friendship is important in helping me develop my personal knowledge. I also participate and lead a youth group in the catholic church in my town; our saying is, “where there are youth, there’s happiness”. I would like to have the opportunity to receive support from you all, people who have the heart to help me achieve my dream. 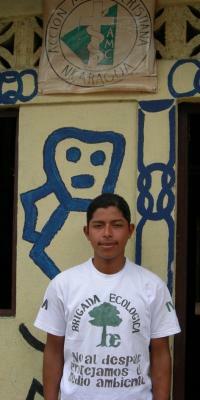 I am 17 years old, I live in El Tuma-La Dalia, in the Department of Matagalpa, Nicaragua. I hope God blesses you all. While I don’t know you, I wish you love and happiness. Thank you, bye bye. Hey Kristin! Tell me how I can send some money for Gilbert. Thanks!